You should post your content on social media when the people you want to see your content are on the network. 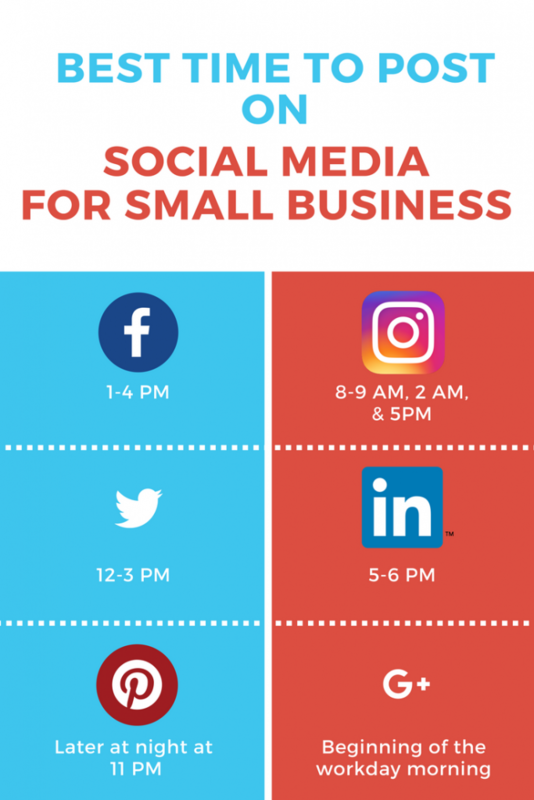 Knowing the best time to post on social media for small business will help you get more traffic, more engagement, and more followers. Part of your social media marketing strategy is knowing how often to you should post on social media. Another part of your social media marketing strategy is knowing the best times to post on social media. You should post your content on social media when the people you want to see your content are on the network. Posting at the best times on social media will help you get more traffic, more engagement, and more followers. The best time to post on Facebook is 1-4 PM late into the week and on weekends. You should post on Facebook on Wednesday at 3 PM, Thursday and Friday at 1-4 PM, and Saturday and Sunday at 12-1 PM. The best time to tweet on Twitter is 12-3 PM, with a peak best time at 5PM. You should tweet on Twitter on Monday to Friday at 12-3 PM and 5 PM, except for Wednesday at 12 PM and 5-6 PM. The best time to pin on Pinterest is later at night. You should pin on Pinterest on Saturday at 8-11PM and Friday at 3PM. The best time to post on Instagram is throughout the week at 8-9 AM, 2 AM, and 5 PM. You should post on Monday and Thursday at any time other than 3-4 PM, as well as experiment with 2 AM, 5 PM and Wednesday at 7 PM. The best time to post on LinkedIn is midweek at 5-6 PM. You should post on LinkedIn on Tuesday at 10-11 AM. Tuesday, Wednesday, and Thursday at 7:30-8:30 AM, 12 PM, and 5-6 PM. The best time to post on Google+ is the beginning of the workday morning. You should post on Google+ on Wednesday at 9 AM and weekdays at 9-11 AM. When it comes to posting on social media, it is best for you to schedule your post ahead of time. Since social media marketing takes a lot of time and effort to maintain, especially with the amount of post you have to post on different social medias, you can always hire a professional like the Retailors Group for social media management.